A year’s worth of creative projects in just a few minutes! I am always active at my origami work bench scribbling out ideas for videos or tutorials, learning new models from many of the tremendously talented paper folders in our community, and always looking forward to meeting more people through feedback and interaction online and at convention. My table, like yours, evolves in time as different projects move across it during the course of a year. As you’ll see too, Lady Coco -our dear sweet assistant loves to spend time close at hand giving her purrrrfectly wonderful encouragement, and is prominently featured. She sends her regards to all. I hope what I show here in this visual journal helps to inspire your own creative work. I wish that in the coming year you find your life full of fun, that you are productive, healthy, and joyous. 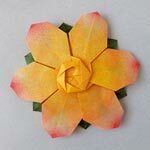 Having the ability and desire to learn, to express yourself through origami, at whatever level, or with any other art that suits you, is a great blessing. Lets all have a great folding year and add some beauty to the world. There can never be enough and it’s always needed. Here are links to origami models highlighted in the video. Way to go, Leyla. Looking forward to learning more from your clear-instruction, nice-to-watch, wonderful-designs tutorial videos ! I so love your table… what a magical place! Wow, what a great video review. You sure did accomplish a lot during the year. Thank you, Leyla! I look forward to this each year! This year I used my settings to slow the video to 25% of its normal speed, so I could absorb more of it. You had a busy 2014! Thank you so much for a super recollection of your origami table during 2014. You are very artistic. You with Juan and Coco have been teaching me how to love origami. I wish you and your team a super 2015 full of love, happiness, music, food, laughter, many trips, flowers etc, etc. Thank you Elsa Lucía. We send all our love to you too! y tiritan, azules, los astros, a lo lejos”…. I know which poem you are talking about, but I don’t think it is included in this book. This is dedicated to the “odes”… Ode to Age, Ode to the Apple, Ode to the Dog, Ode to the Cat, Ode to Salt…etc. I wish I could write an ode to Pablo Neruda! I feel encouraged to follow in your footstep and keep an Origami journal. Watching this video brought back pleasant memories of folding the origami models you recommended. Thank you and may 2015 brings the best yet from Origami Spirit! I enjoyed watching this soooooo much!! Love seeing your year of creativity with origami. Loved seeing your cat. Reminds me of mine always trying to bud in on what ever I am doing. Thanks for sharing! You are welcome, Cynthia. Thank you for your warm words! Where do goosebumps come from? This past year has been another remarkable effort from you Leyla, to bring to us all, the most spectacular models always superbly taught. Behind and inside each tutorial is always a gentleness and, I feel, the essence of the true spirit of origami; and that indeed is love. Thank you as well to John and Coco who are quite obviously your inspiration and hard-working partners. Best wishes for another amazing year: 2015! I remember reading “Letters to Theo”, the letters that Van Gogh wrote to his brother. It caused me a lasting impression. I loved it! Leyla, you have such a huge collection of origami treasure, each one of them is so unique and lovely. Looking forward there will be more and more tutorials, so all of us can learn and enjoy the love of paper (origami) can bring us despite everyday chores and chaos, that we can truly sit down and refresh a moment by entering in the origami world of entertainment and achievement while we enjoy your demonstration. Have a wonderful and joyful New Year.